A look into revolutionary cognition that argues for the necessity of cultivating radical subjectivities. Arguments for automatic consciousness are critiqued, and the role of struggles, ruptures, and breaks is explored. How is liberation possible? Or alternatively how can it be brought about? It was likely the Russian Revolution or perhaps the failures of the Paris Commune that stimulated the left’s appetite for strategizing on these issues. Faced with possibilities laid in front of revolutionaries, and without a clear path ahead, the appeal of a coherent move, revolutionary judo, is enticing. A series of versions of the same argument exist in the left today. I call this the Death Star Argument based on Bring the Ruckus’ use of the term to refer to a central point in capitalism that can be attacked and the whole system will fall. This approach is wrong, not simply because of the target or strategy, but wrong in a more fundamental way. That is, it thinks about revolution in a way that distorts our tasks and the possibility of a truly transformative rupture. The Death Star Argument identifies a key structural point within capitalism, which the whole structure rests upon. If attacked, the theory is that the system will be so weakened, it will be unable to defend itself, and will crumble under its own weight. The classical version of this is the industrial working class. If key sectors of production (usually energy, manufacturing, transportation) can be brought under the control of revolutionary workers, the idea is that capitalism will be so dismembered by the loss of key engines that workers power will emerge. Another version is race in the United States as the basis for all capitalism. Without the compromise between privileged workers and the ruling class, workers would rise up and destroy the system all together. The idea then is to attack white privilege, and thereby undermine the relation that allows class exploitation to exist. The last example I’ll use is the idea that capitalism is built upon unwaged labor by women to reproduce wage labor. Some argue for a death star analysis in that if wages were demanded, capitalism would fall because of the weight of having to pay for formerly unwaged labor in the home. Whatever centrality these elements may have, and we can learn from what discussion emerges from these proposals, liberation is not a process of attacking some central pole. Firstly, capitalism is incredibly flexible. Given its ability to continually overcome struggles, in general we should be skeptical of arguments that this time, with this struggle, it will really have no escape. There are lots of escapes, foreseen and otherwise. We should have more faith in capitalism’s robustness than with our capabilities to predict Achilles heels. Second, even if it was likely that capitalism could fall from being attacked at one crucial point, we should be skeptical that this will get us what we want. It is not merely that capitalism holds back billions of people from fulfilling the inner desire for a free stateless communist society. People themselves reflect all the contradictions, aspirations, repressions, and possibilities that society as a whole does. We both reproduce capitalist and statists relationships with others and inside ourselves. Our dreams are often the dreams of the society we grow up in, just as the vision of the left was often a bourgeois vision multiplied to everyone. The Death Star framing, and others like it, obscure the central role of a radical cognition (what I will call subjectivity) or a new protagonism. To create an liberatory society requires not simply a defeat of the system, but something more; it requires people fighting for it. How is that possible? The appeal of determinism on the one hand (the inevitability of victory) and substitutionism on the other (the imposition of our vision onto unwilling others) comes from how unlikely this is; both are dead ends. It’s worth thinking about the barriers. Why is it so difficult for there to be a conscious liberatory movement, and why has it seemed so unlikely that many (if not most) thinkers abandon it from the start? The power of the state and capitalists is immense. Armed not simply with force, but also an ideological apparatus for maintaining hegemony, it is difficult to imagine a potentially threatening movement gaining the upper hand. It would be crushed or outgunned in the ideological battle for consciousness. Today we all maintain the force of the state less by direct coercion than by the diffuse reproduction of statist social relationships. The state and capitalism are made up in large part by the statist and capitalist cognition in society. Additionally, there are many reasons not to want to leave this world as we know it. Some people do benefit from it, perceive interest in keeping what they have, and fear other possibilities more than dislike their existence presently. Struggling is fairly miserable and carries significant risk. Even as present arrangements crumble, many remain ideologically tied to them, and seek to bring back to life what is dying. Lastly the recuperative powers of the system are mighty. When people do manage to break from the system and are organized, capitalism can put a lot of butter on the table. Even a minority which is co-opted by the promise of better capitalism (social democracy, fascism, populism, state capitalism, etc) can cripple revolutionary movements in key moments. It speaks to the strength of the system that it could endure so many challenges in the 20th century and perform alchemy on threatening movements, turning them into bastions for proletarianization, repression, and capital expansion across the globe. Fundamental transformation is possible though. The above discussion outlines the key missing feature which is the will and cognition necessary to fight, and the drive that could level barriers. The problem is one of possibility and organization. The limitations suggest that huge numbers breaking with the system and fighting for a radical alternative, majorities, are unlikely outside of extraordinary and strange times. With any social phenomenon everything is uncertain. Perhaps this is wrong, and in fact explosions will bring everyone to fight to the death against the system and against reformist cooptation. We might get lucky. We shouldn’t count on it though, and it doesn’t help us think through getting where we want to go. Minorities, potentially large minorities, can and have come to positions where they fight the system beyond their own personal investment in the fights and towards something beyond capitalism and the state. Now normally people don’t want to live in a state of constant war with the boss, landlord, police, or officials. Under normal times struggles are somewhat limited. However, struggles and isolated ruptures emerge that can allow the opportunity for testing ideas, as well as radicalizing people in the process. Fighting, even in a limited fashion, can change social relationships and daily routines in such a way that people are able to reflect upon and question values, goals, and world views. This is not automatic, but cognition in struggle can expand the space opened by breaking with the normal means of settling disputes, and help produce new protagonists. Through this fluid interplay between struggle, values, and ideas, these minorities can be built which have their basis in resistance, breaking from the normal means of disputes, and implementing an alternative social order against recuperative attempts. When we speak of these fights, we speak of individuals, groups, and sometimes larger groups. However, cultivating a radical subjectivity means going deeper. Though we are limited under the dominance of statist and capitalist social relations, this does not mean that we cannot facilitate a widespread, present, and active counterpower advocating for this subjectivity across a wide basis. There is a difference between creating an oppositional culture, and having fertile ground for its growth. There are times where seeds are planted, widely and persistently, times where we are tending crops, and there is harvest time. This is to say we need the creation of networks to transmit, grow, and evolve an oppositional consciousness throughout society. Though it’s difficult if not impossible to predict whether struggle is moving up or down, except in the most combative times, when the normal course of affairs is certain we have those two tasks ahead of us: developing committed revolutionaries through struggle and study, and reproducing an oppositional milieu throughout society. There are other times. Political or economic crises can lead to the breakdown of normalcy. Ruling classes can decompose, governments can fracture, explode, or topple, and war can obliterate. Crisis creates both conscious and physical openings. It’s important to understand that crisis doesn’t mean suffering. Paris 1968 was primarily a political crisis, not a matter of economic misery. The fundamental element of crisis isn’t deprivation, but the impairment of power to exercise itself. This can be because of fights within the ruling class to address a problem (Great Depression, Vietnam war, Eurozone financial crisis, etc), incapacitation (WWI, Russian Revolution, Weimar Germany), or the need to destroy old capital and powers and replace it with new ones (globalization). There are crises and then there are crises. Crises are inevitable, but not an ultimate crisis. As the system loses capacity to provide, co-opt, and maintain the transmission of power during a crisis, space is opened up for other elements and ideas to step into the fore. The inevitable struggles that arise around the reorganization of society and forces with crises can develop rapid shifts in consciousness and organization. Still it’s important to remember that if people are fighting simply because a government is morally bankrupt, or their home is seized, these problems can be solved by a new home and an ethical reformist government. The left is not immune to these forces. Historically, in crisis the left often ends up to the right of the people, and many revolutionaries are born not of the existing left, but of the new struggles bursting out of a disarmed and crumbling ruling class. Entering such a crisis with a militant minority, the conscious creation of an oppositional milieu, and the space rupture opens provides us with a guide for how transformations might be possible. This points to a few factors. First, the method and content of struggle matters. A radical subjectivity doesn’t mean fighting for one’s house, but it can mean fighting for one’s house as part of a fight for something bigger. This is to say that there is specific liberatory work, both in how we fight for it, and what our fight demands and looks like (method and content). There are many crises though, some worse than others. A key factor in revolutionary moments is when the ruling class is no longer able to function as it had before. Concessions are not easily given, force is more difficult to apply, unity breaks down, and the path forward is uncertain. It is in these moments that all the potentialities converge and show us how radical subjectivity can emerge in a widespread basis. In actuality, the moral bankruptcy and delegitimization of the existing institutions is a pre-requisite for rupture, rather than the other way around. Yet the breakdown of those institutions is the soil that lets transformative subjectivity grow and develop further. This is not an overnight process, nor is it simply a conscious journey as phenomenologists (perhaps Freire and Fanon) would have it. There are no guarantees. Radical subjectivity will largely be an emergent consciousness that arises from an oppositional milieu, work of a plurality of militant minorities, and revolutionary crisis. Rupture is thus not enough, minorities not enough, and simple education and hegemony not enough. Ideology is not taught, distributed, won, or given. Cognition is like an organism, which provided the right context, and incubating within a living process of struggle, comes to a fragile birth only in the most singular circumstances. The cells and organs building towards the self-organized life of anarchism are unaware of each other, without foresight or perspective, and forming and transforming in intimate relationship with one and another. We cannot expect that our vision and strategies can stab directly at capitalism, as though it were a monster. Capitalism is a living organism, and we ourselves are a part of it, reproducing and developing it within. Understanding it’s sustenance and reproduction however gives us insights as to how a better world can be born from it’s transformation. Just skimmed this, but wanted to say kudos on the pic - really great choice for the subject matter. Yeah, the pic is great. 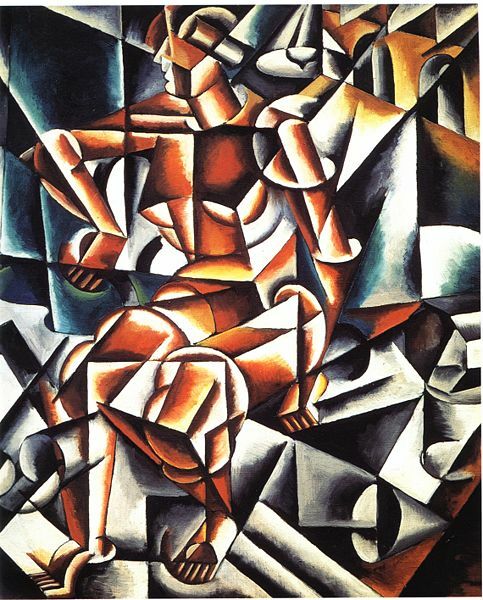 I love futurist and Suprematist art.